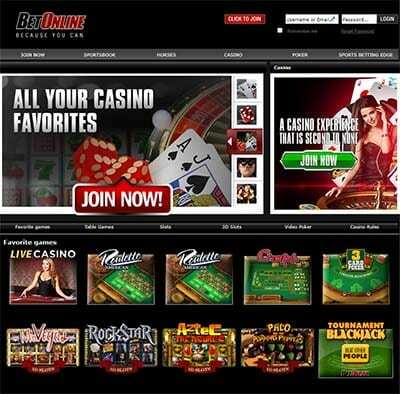 BetOnline is an online gambling site known for its range of sports betting, horse racing and poker options, but it also offers an online casino where players can place real money bets on classic casino games like slots, blackjack, roulette, poker and more. While it’s not one of the most impressive online casinos out there, BetOnline remains popular due to the fact it accepts players from a wide range of countries, including the United States, and accepts payments exclusively in USD. The team at Betting Planet has thoroughly tested BetOnline Casino to provide our readers with a comprehensive review to determine whether this casino site is worthy of your time and money. If you’d rather play online casino games without having to download any new software to your computer, BetOnline has you covered, as the casino is powered entirely by instant-play, which means you can play directly over your Web browser with no downloads required. As long as you have a solid Internet connection, we have found BetOnline games to be fast to load and using crystal clear graphics. BetOnline also offers an instant-play mobile casino, although this looks like it came straight out of the late 90’s and is pretty visually outdated. The mobile casino won’t let you access games unless you sign up for an account, and with so many more impressive mobile casinos out there (like the award winning Leo Vegas mobile casino) BetOnline mobile should probably be avoided unless you’re a US player whose options are limited. BetOnline focuses on the US market, and have an online sportsbook section – read our official BetOnline betting site review for more information. BetOnline offers a pretty hefty welcome bonus, but the bonus offers are poorly advertised so it can be difficult to know what you are eligible for. If you sign up for a casino account via BettingPlanet.com, new players can take advantage of a giant 200% matched deposit welcome bonus that will give you up to $5,000 in bonus money to use on BetOnline’s online slot games. When making your first real money deposit, make sure to enter promo code ‘CASINO200’ to claim this exclusive bonus offer. A minimum deposit of $25 is required to take advantage of this promo, up to a maximum of $2,500 (this would give you the highest possible bonus amount, with a deposit of $2,500 with a 200% bonus meaning your account would now sit at $5,000). A sweet deal? Yes, but BetOnline’s sign-up bonus comes with a substantial wagering requirement of 60X before any payout can be made with the bonus money, which is up there with the highest play-through requirements we have ever seen from an online casino. And with slots being the only game that will contribute to the wagering requirements, this bonus could have zero value for players who are here for the table games. Keen to see what other casino bonuses are out there? Check out our guide to the best online casino sign-up offers. In addition to the welcome bonus, BetOnline is known to offer special one-off promotions to registered players. To stay in the loop of these bonuses, you will need to sign up for an account and keep an eye out in your email inbox or text messages, or sign in at BetOnline regularly to check your account. You need to be quick to act, as any promotional bonuses offered via email, chat, telephone or by internal messages are valid for a maximum of 24 hours unless a valid date is accompanied. BetOnline offers games exclusively from leading online software developer, BetSoft, which is well known for its impressive selection of 3D online slot games, known as the Slots3 collection. BetSoft games use the latest in cinematic-grade animation to create an engaging and entertaining online slot experience, with games that use all kinds of creative themes and have plenty of unique bonus features. While we’re huge fans of BetSoft’s slot games and some of these slot titles are up there with our all-time favourites, we’re used to being spoiled for choice at casino sites like Slots Million, where there’s thousands of slot games available for 30+ of the best software developers in the bizz, so BetOnline’s selection leaves us wanting more. Slots are divided into two categories: slots and 3D slots. Under the standard slots category you will find a range of three-reel and five-reel games, while the 3D category houses close to 40 of BetSoft’s leading slot titles, including Fruit Zen, Mr Vegas, Dr Jekyll & Mr Hyde, Gypsy Rose, It Came From Venus and At The Movies. You’ll also find Baccarat, Red Dog and Hi/Low Draw games available. A decent range of video poker games are also on offer, including Jacks or Better, Deuces Wild, Joker Poker, All American Poker and several others. A selection of live dealer games are available for registered players only – unlike the slots, video poker and table games, the live dealer games cannot be sampled for free in practice mode and can be played with real money bets only. Is BetOnline safe and regulated? BetOnline has been in operation since 2001 and in that time, it has established a reputation as a safe online venue to place real money bets on sporting events, horse racing, poker and online casino games. The casino runs out of Panama City and is licensed by the Government of Panama, which isn’t a well-known jurisdiction for online gambling licenses, but does have a decent reputation nonetheless. All transactions that take place at BetOnline are protected by 256 Bit SSL (secure socket layer) digital encryption security to ensure player information is safe and protected. A customer service help line is available, and BetOnline also supports responsible gambling practices by offering a self-exclusion service. Players from all countries are accepted, except Egypt, Ghana, Indonesia, Macedonia, Malta, Montenegro, Morocco, Nigeria, Pakistan, Panama and Ukraine. The real drawcard to BetOnline is that American players are accepted, so for US players, this online casino provides a good option. For players from other countries who are accepted at a wide range of online casinos, you may want to read the reviews of our other top-rated casino sites for a better looking casino site that offers games from a larger range of software developers. If you’re from the USA, BetOnline provides a safe place to deposit and play for real money bets using US currency, with a good selection of deposit methods available. You can also use a single account to play casino games and bet on online sporting events, making BetOnline a good comprehensive betting platform. Keen to give BetOnline a try? Sign up for an account and you can claim a 200% matched bonus when making your first real money deposit.